Can you see the colours? Ever wondered what these funny looking charts are used for? They are called Ishihara charts. 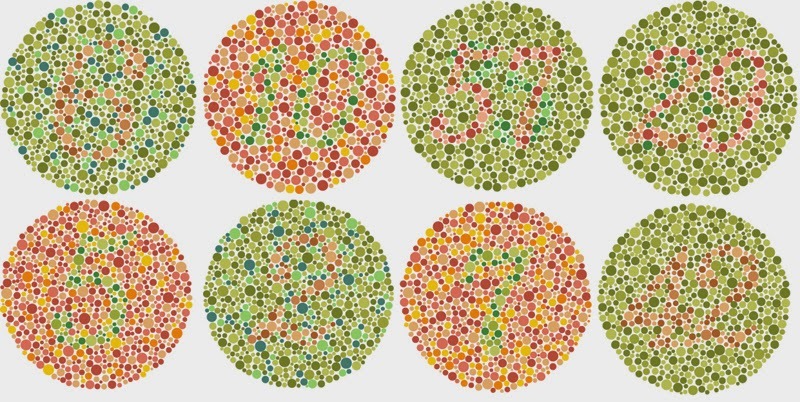 Dr Shinobu Ishihara introduced them in 1917—almost 100 years ago—the most well-known color blindness test. Each of his tests consists of a set of colored dotted plates, each of them showing either a number or a path. Since then this is the most widely used color vision deficiency test and still used by most optometrists and ophthalmologists all around the world. If you have a colour deficiency or are colour blind, everyday life will present itself with many challenges and difficulties which normal sighted people are totally unaware of. Think about it. Even the most simple of activities including choosing and preparing food, gardening, and sport, driving a car and selecting clothing can be difficult. It’s like what if you don’t notice your child getting sunburnt? Most red/green colour blind people won’t know if they have cooked a piece of meat rare or well done and they are unlikely to be able to tell the difference between green and ripe tomatoes or between ketchup and chocolate sauce. Colour blind people often try to eat unripe bananas because they can’t tell the difference between a green unripe banana and a yellow ripe banana – to them because both of the colours are the same shade they think they are the same colour. Some food can look repulsive if you are colour blind, and colour blind children can seem particularly fussy over green vegetables – spinach can look like cow pat and colour blind children probably mean it if they say their food looks like poo! Colour blind people can get quite cross with electrical goods which have red and green LED displays to indicate either that a battery needs charging or the machine is on standby. An example might be a handheld games console with an indicator light which changes from red to green depending upon whether the unit is fully charged or needs recharging. This can be very frustrating, particularly for a child. The simple test can be performed to check if you or your child have a colour deficiency or not and suitable adaptations can be made to help in everyday life.